Welcome again in the second version of this article which decrease your development effort and gives you a shortest way to code your idea in your application. In this article we will see different debugging supporting tools like Pinup variables, adding comments while debugging, last run debugging value, other debugging windows like local, autos, watch, Immediate Window, call stack, shortcut keys etc. Data tip is nothing a kind of an advanced tool tip that can be used to show in detail object or variable during the debugging of the application. check following snap, which will gives you idea. it will again vanish and cannot hold values. Visual studio has great features over it, we can use pinup and unpin features, it will allow you to pinup current value of a variable. We can pinup as many object as we can. These values can be used for further reference. When you are at bottom of code while debugging you can change the position of pinned up variables. Click on that pin icon to make it pinned. it will remain same Unless you manually close these pinned items or unpin it from source code. Do you know we can give comment to any point or variable while debugging, it’s a one of the amazing features of visual studio 2010. Additionally you can drag and drop your comment and pinup them to any part of the screen so, when you debug it in large code, you can drag the pinned value with you to the end of the screen. To add variables in the watch window, you need to “Right Click” on variable and then select “Add To Watch”. As name suggest 'Local' this window helps to get the variable information with their current value. 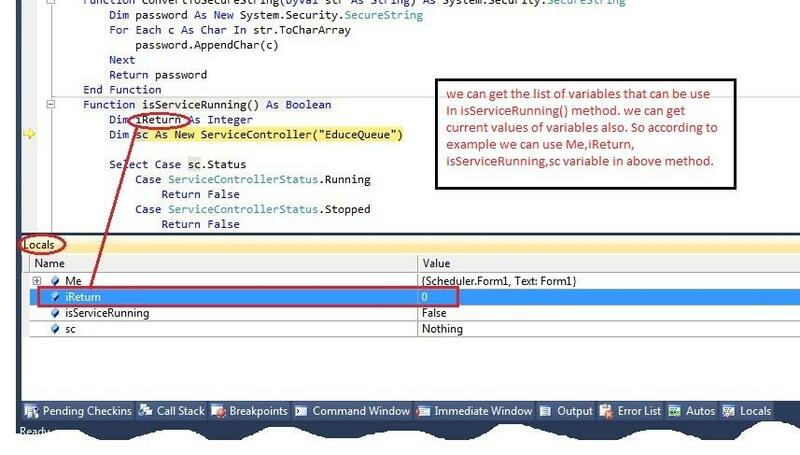 infact this method gives us list of variables within a scope of current method. so we can get the variable list that we can used in current method. Very popular and very used feature of visual studio is Immediate Window, by which we can see the runtime values of variables and objects, even we can calculate any number of expression here. but the drawback of immediate window is, we cannot get the variable values which are out of scope. local, autos, ObjectID, immediate window, call stack. Thanks Ketan, Felling glad that it helps you.